A sculpture crafted from some of the firearms handed in during the 2003 amnesty in London has been unveiled. Lucy Wood's Map 272183, which relates to the Ordnance Survey reference for the London's 32 boroughs, was revealed at the Met's Gun Crime Conference. Thursday's event was organised to discuss ways of reducing crime. Deputy Met Commissioner Sir Ian Blair said after the conference in Hendon, north London, the community must play a part in combating gun crime. Sir Ian, who is Deputy Commissioner until he takes over from Sir John Stevens at the end of January, said he was opposed to the total arming of the police. "We have got to stop young men getting to 17 and seeing their only way to self-esteem is the possession of a gun," he said at a press conference. "We have got to give them other avenues ... it is not for the police to do that, it is for the community to do that. "Enforcement alone is not enough for this problem." Home Secretary David Blunkett was also due to attend the conference at Hendon Police School. Following the conference Ms Wood's sculpture was unveiled. 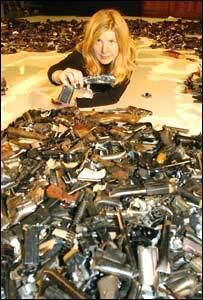 The artist had contacted the Met to ask for some of the 3,085 weapons handed in during the 2003 gun amnesty. She said: "Guns contain a sense of fear and anxiety, yet give the holder a sense of superiority. "However, once broken up into small pieces, they no longer serve any purpose."